We’d love your help. Let us know what’s wrong with this preview of Permanence by Karl Schroeder. Young Rue Cassels of the Cycler Compact -- a civilization based around remote brown dwarf stars -- is running from her bullying brother, who has threatened to sell her into slavery. Fleeing in a shuttle spacecraft from the sparsely populated and austere comet-mining habitat she has lived in her whole life, she spots a distant, approaching object, and stakes a legal claim t Young Rue Cassels of the Cycler Compact -- a civilization based around remote brown dwarf stars -- is running from her bullying brother, who has threatened to sell her into slavery. Fleeing in a shuttle spacecraft from the sparsely populated and austere comet-mining habitat she has lived in her whole life, she spots a distant, approaching object, and stakes a legal claim to it. It is not the valuable comet she hoped for but something even more wonderful, an abandoned Cycler starship. Her discovery unleashes a fury of action, greed, and interstellar intrigue as many factions attempt to take advantage of the last great opportunity to revitalize - and perhaps control - the Compact. This is the story of Rue's quest to visit and claim this ship and its treasures, set against a background of warring empires, strange alien artifacts, and fantastic science. It is a story of hope and danger, of a strange and compelling religion, Permanence, unique to this star-faring age, and of the re-birth of life and belief in a place at the edge of forever. To ask other readers questions about Permanence, please sign up. "The discovery that made interstellar travel possible was made in 1997; but at the time no one recognized its significance..."
So opens Permanence, set in the 25th century, when humanity has settled dozens of extrasolar planets -- the so-called "lit worlds" -- and thousands of brown-dwarf colonies -- the halo worlds. All the colonies were linked by big, NAFAL starships, each travelling a fixed circuit of worlds -- the cyclers . The cyclers never stop, as the energy cost to boost them to relativi "The discovery that made interstellar travel possible was made in 1997; but at the time no one recognized its significance..."
So opens Permanence, set in the 25th century, when humanity has settled dozens of extrasolar planets -- the so-called "lit worlds" -- and thousands of brown-dwarf colonies -- the halo worlds. All the colonies were linked by big, NAFAL starships, each travelling a fixed circuit of worlds -- the cyclers . The cyclers never stop, as the energy cost to boost them to relativistic speeds is, well, astronomical. Ultra-light shuttles transfer passengers, crew and cargo at each port. "[The colonies] swarmed like insects around incandescent filaments hundreds of kilometers in length. Each filament was a fullerene cable that harvested electricity from Erythrion's magnetic field... The power running through the cables made them glow in exactly the same way that tungsten had glowed in light bulbs... on twentieth-century Earth." I love this stuff. And it's even plausible. Schroeder's very good at delivering the short, sharp shock: Rue's poor, then she's rich! Oops, bad claim, poor again. Wait, she's rich after all! This 'Perils of Pauline' plot structure works pretty well for most of the book, but was wearing thin towards the end. Again, these are sophomore-book teething problems, easily forgivable within the terrific story (and backstory!) that Schroeder's got to tell. Which is: classic, wide-screen space-opera with a sharp hard-sf edge -- my favorite kind of SF! Folks, this is the good hard stuff, which is never in oversupply. So if you haven't yet tried Schroeder's brand of thinking-being's hard-sf adventure stories, Permanence is an excellent place to start. Then you can go back and pick up on last year's Ventus, which might even be better. They're both terrific books. Happy reading! I'm sorry to say, I couldn't bring myself to finish this one. The ideas behind the novel are somewhat interesting; not fascinating, just enough to make you go 'Hmm.' Once you marvel at the civilization Schroeder built around brown dwarfs, all you're left with is a poor plot that is childish and amateur. There's something annoyingly artificial about the way the characters are written. They go along with mad ideas just because the plot requires a crew for the protagonist's quest. The events that li I'm sorry to say, I couldn't bring myself to finish this one. The ideas behind the novel are somewhat interesting; not fascinating, just enough to make you go 'Hmm.' Once you marvel at the civilization Schroeder built around brown dwarfs, all you're left with is a poor plot that is childish and amateur. There's something annoyingly artificial about the way the characters are written. They go along with mad ideas just because the plot requires a crew for the protagonist's quest. The events that litter the book seem dangerous on the surface, but feel like book-padding, and are never really engaging. One example is Max, the protagonist's cousin. He somehow shows up at the start of the novel, and conveniently turns out to be very rich, which conveniently solves the heroine's problems. Not only is he rich, but he also conveniently won the lottery, so there's nothing to explain about it. Such events occur at a maddening frequency, painfully linking what certainly sounded like good plot points in a synopsis. I bought this book a decade ago, after hearing quite a bit of fuss written about it. Already, it has managed to influence many other science fiction universes, with its concentration on brown dwarfs and their planetary systems and the human cultures which have sprung up on their worlds. Read Simon Bisson’s excellent review. evildrganymede is livejournal’s local expert on brown dwarfs, published and everything, so he can correct me. Briefly put, brown dwarfs are star-like objects which lack suffic I bought this book a decade ago, after hearing quite a bit of fuss written about it. Already, it has managed to influence many other science fiction universes, with its concentration on brown dwarfs and their planetary systems and the human cultures which have sprung up on their worlds. Read Simon Bisson’s excellent review. This has implications for a human interstellar civilization, particularly if the interstellar propulsion methods used are limited by distance, for instance like 2300AD‘s stutterwarp drive. In the 2300AD universe, for instance, within the range of stutterwarp drive from Earth, for instance, there are only five stars–Wolf 359, Barnard’s Star, and the three stars of Alpha Centauri. The limited range of the stutterwarp interstellar drive establishes a highly specific astrographic setting, with the only stars reachable being those which lie within range of other stars which are themselves reachable only by stutterwarp. If there were, in addition to the five main-sequence stars already mentioned, ten brown dwarfs located at random within 7.7 light years of Earth, this would drastically open up the volumes of space accessible to human interstellar civilization. Only the most isolated stars could not be reached. More, there could well be suitable targets for colonization in these brown dwarf planetary systems, which did, after all, form like the planetary systems of main sequence stars. Terrestrial-type planets could be terraformed, moons like the Galilean satellites of Jupiter and Saturn’s Titan could be colonized by people with suitably advanced technological packages, and asteroid belts orbiting Brown Dwarf #1897 would be indistinguishable (for colonization purposes) from asteroid belts at Wolf 359. Superjovian planets in interstellar space might be more common still than brown dwarfs, but again, the same provisos relating to their suitability as way stations for interstellar travellers and destinations for colonization missions apply. Introducing brown dwarfs and superjovian planets to an interstellar civilization should have the effect, in short, of drastically expanding its volume. Anyway, I highly recommend Permanence. read it at the library, or better yet buy one. Schroeder definitely deserves to be rewarded. This book took a while to get into, but into it we did done got. Er. I've always felt that the best science fiction isn't about the technology, the aliens, or the general freedom it gives to authors to just make up stuff they think is neat. Those stories work only with readers who share the fantasies that the author is playing out. Great science fiction is about people. The speculative aspect of science fiction allows the author to give relevance to an idea that would be entirely abstract in rea This book took a while to get into, but into it we did done got. Er. I've always felt that the best science fiction isn't about the technology, the aliens, or the general freedom it gives to authors to just make up stuff they think is neat. Those stories work only with readers who share the fantasies that the author is playing out. Great science fiction is about people. The speculative aspect of science fiction allows the author to give relevance to an idea that would be entirely abstract in real life. I was surprised at how good this was! It's got some very believable alien and space environments together with some novel ideas about humans interacting with aliens and the ultimate destiny of humans in space. The characters felt realistic and I cared about what happened to them. I must admit to finding the basic plot inherently interesting (it's kind of like Rendezvous with Rama but bigger in scope and with more action). For some reason I found this hard to read quickly, but it was still engagin I was surprised at how good this was! It's got some very believable alien and space environments together with some novel ideas about humans interacting with aliens and the ultimate destiny of humans in space. The characters felt realistic and I cared about what happened to them. I must admit to finding the basic plot inherently interesting (it's kind of like Rendezvous with Rama but bigger in scope and with more action). Non mais dites donc ! Si Ventus, son précédent roman était pas mal, il m'avait laissé un goût d'incomplet, ou plutôt un côté pas complètement éclairci (1). Heureusement pour moi, ça n'est vraiment pas le cas de ce roman, qu'on peut tout de suite placer dans la catégorie des très, très bons romans. Mais reprenons du commencement. Dans ce roman, on suit d'abord les aventures de Rue Cassels, une jeune femme qui, par un jeu de circonstances de l'ordre de l'extraordinaire (2), se retrouve en possessi Non mais dites donc ! Si Ventus, son précédent roman était pas mal, il m'avait laissé un goût d'incomplet, ou plutôt un côté pas complètement éclairci (1). Heureusement pour moi, ça n'est vraiment pas le cas de ce roman, qu'on peut tout de suite placer dans la catégorie des très, très bons romans. Mais reprenons du commencement. Dans ce roman, on suit d'abord les aventures de Rue Cassels, une jeune femme qui, par un jeu de circonstances de l'ordre de l'extraordinaire (2), se retrouve en possession d'un vaisseau spatial étrange. Rapidement, elle se retrouve accompagnée par un tas de personnages assez sympathiques - ou pas. Evidement, le plus intéressant d'entre eux est Michael ... heu ... j'ai oublié son nom. Comme je l'ai dit dès le début, j'ai trouvé ce roman très intéressant, pour bien des raisons d'ailleurs. La première, c'est simple, c'est une révélation. A un moment, Michael, tiraillé par une crise de sa foi non métaphysique, nous fait entrevoir le destin inéluctable de l'espèce humaine et, d'une certaine façon, son unicité. Si je me souviens bien (3), il commence par expliquer que toutes les civilisations spatio-pérégrines se sont éteintes, pour une raison simple et franchement terrifiante à l'échelle humaine : pour vivre dans l'espace, il faut être adaptable, mais être adaptable, c'est un trait qui apparaît seulement chez les espèces inadaptées à leur milieu, et ça veut aussi dire le maintien de conditions de vies non naturelles, et donc forcément sujettes à extinction, ce qui implique la destruction de l'espèce. En un mot comme en cent, Schroeder prononce dans ce roman la fin obligatoire de l'Homo Sapiens Sapiens. Et ça, pour moi, c'est un choc. Parce qu'il ne prononce pas "la fin de la civilisation telle que nous la connaissons", ni la fin de l'humanité unifiée. Non, lui, il prononce la fin de l'être humain en tant qu'espèce. C'est-à-dire que, selon lui, la seule chose qui permettrait à l'homme de survivre plus de quelques millions d'année, c'est de ne plus être humain, mais aussi, et surtout, de ne plus être conscient. Effrayant, en un sens, non ? Donc, ça, c'est une révélation qui m'a beaucoup fait réfléchir. L'autre attrait de ce roman,c 'est la façon de révérer l'univers qu'ont les héros, chacun à leur manière. Michael essaye de trouver l'esprit divin de chaque lieu, et Rue quant à elle essaye de faire de sa vie quelque chose qui mérite d'être revécu, car elle est persuadée que l'unviers est cyclique, et que sa vie, qu'elle le veuille ou non, lui reviendra à la figure. Des conceptions très différentes de notre monde, pour un monde lui aussi très différent, et très poétique, j'ai trouvé. Enfin, la partie poétique, pour être honnête, ce sont bien évidement ces mondes du Halo, plongés dans une pénombre naturelle que ne peuvent changer que des soleils artificiels nourris à la magnétosphère des étoiles naines autour desquelles gravitent ces mondes (rien que de l'écrire, je trouve ça beau). Parce que de l'autre côté, c'est-àdire dans l'économie des droits, c'est autre chose. je pense - à titre purement personnel - que c'est dans cette économie que l'auteur a essayé d'être le plus prospectiviste. il an ainsi choisi de nous présenter une civilisation spatiale ne cherchant que le maintien d'un état de fait inacceptable, dans un univers qui ne peut pas être vu de cette manière. Qui plus est, l'état de fait qu'il nous présente, avec les droits attachés à chaque objet, m'a furieusement fait penser à une version légèrement futuriste du système capitalistique actuel. La grande force dans cette civilisation, d'ailleurs, c'est que l'auteur ne prend pas vraiment partie. oh, bien sûr, on sent bien que les rebelles ont sa sympathie. Mais c'est peutêtre parce qu'ils favorisent indirectement les mondes du Halo sur lesquels s'appuie l'intrigue du roman. Mais ça n'est pas très franc. Et ça permet du reste - comme d'habitude, j'aurais tendance à dire - à l'auteur d'être moins manichéen dans la vision de cette société, et du coup beaucoup plus percutant dans son analyse de ce système économique. Je pourrais dire encore bien des choses, je pense, de ce roman, positives pour la plupart (comme les intercepteurs de la fin, qui sont une espèce de saut quantique dans cet univers, et d'incroyable machine à sensations pour le lecteur), négatives pour certaines (comme le côté un peu facile de l'intrigue, mais je pense que c'est presque voulu). Mais je crois que ce serait louper le coeur de cette histoire, qui ne tient pas vraiment à la course après l'étrange artefact extra-terrestre qui va changer l'univers (puisque c'est le style de récit space-op dans lequel s'inscrit théoriquement ce roman), mais beaucoup plus à la réflexion sur le destin des civilisations, la vacuité d'une volonté expansionniste qui ne permet pas réellement d'exister sur le long terme, et plus de promettre aux voisins galactiques un joyeux feu d'artifice. A titre tout à fait personnel, tout cela m'a énormément plu. C'est un roman solide, profond (même si Rue m'a parue un peu archétypale, dans son rôle de cheftaine scoute toujours prête à repousser ses limites, mais pétrie de doutes sur ses moyens), intéressant par sa conclusion qui est loin, très loin d'être claire quand j'y réfléchis bien. A mon sens, tout cela suffit largement à en faire l'un des tous meilleurs space-opera ... Bon, j'ai dit ça il y a peu de temps pour Sculpteurs de ciel et c'est vrai pour les deux, même si ce sont des romans très différents. mais c'est ça l'intérêt majeur de la science-fiction, non ? Offrir des oeuvres toujours renouvellées, toujours intéressantes, dans des directions très différentes. (1) Je veux dire par là que certaines choses n'étaient pas complètement claires une fois la dernière page lue. circonstance qui la rend fabuleusement riche est tout sauf commun. Writing: The reader is right there in the action. Pace: Never a dull moment! I really enjoyed this space romp. My only little criticism is that it starts out entirely from Rue Cassels viewpoint and abruptly changes viewpoint to Michael Bequith about 100 pages in. I wasn't expecting it and it was a little jarring. On the small scale, the story is about Rue and her attempts to get away from her controlling half-brother and to find her place in the world. On the macro scale, it's about competing philosophies about how to keep a large, far-flung group of human colonies in to I really enjoyed this space romp. My only little criticism is that it starts out entirely from Rue Cassels viewpoint and abruptly changes viewpoint to Michael Bequith about 100 pages in. I wasn't expecting it and it was a little jarring. On the small scale, the story is about Rue and her attempts to get away from her controlling half-brother and to find her place in the world. On the macro scale, it's about competing philosophies about how to keep a large, far-flung group of human colonies in touch with and trading with one another, and what makes us human. Recommended. This is a very typical Male Science Fiction Author book (the good kind, at least) in that it had absolutely mind-bendingly fascinating sci-fi ideas and forgettable characters and relationships between them. When I think about this book a year from now, I will not remember the name of a single character, but I will definitely remember the unique aliens, provocative ideas, and universe-altering technology. A classic 3.5 book. I went with 4 as I liked the characters. The science and plot were very good too. I've read a lot of Karl Schroeder and I didn't really connect with this one. Some cool concepts but I had trouble really getting into it. Rue Cassels steals her inheritance, which includes part-ownership of a ship, in order to escape her older half-brother and forge a new life for herself outside of his control. While in transit, she stumbles upon on unregistered comet, and stakes a claim, making her wealthy... but things only get more complicated when the comet turns out to be a cycler, a starship that runs on a cycle around the dim, chilly worlds that have been colonized between stars, like Rue's. Cyclers haven't been coming by as often as they used to, since the development of FTL that only works near stars, and Rue's society is slowly withering. A single cycler would help, but she soon learns that there's a lot more going on, and the stakes are a lot bigger than one person, one world, or even one species. I read this book once before, and although it wasn't my favorite of Schroeder's, by far, I still quite enjoyed it. There's a lot packed into this book, ideas about the destiny of intelligent life, inventive and bizarre alien races, speculation on how people might live, a new, non-mystical religion for humanity, a new form of capitalism based on microtransactions, and plenty more. There's also a lot of plot. It's not a simple "get to the space ship and explore" book, even though that could easily have filled a whole novel... but there's a lot more plot than that. Maybe, unfortunately, a little too much. Because with all the ideas Schroeder likes to explore, and all the plot he has to get through, a book only has so many pages and unless you do it very very well, things will fall by the wayside. In this case, the pacing feels off, as characters jump from situation to situation constantly, sometimes with rather convenient plot railroading to make it possible, and without much chance to explore any of them in particular, except in some cases where there's long digressions to explore some neat idea about how to build a livable world under a particular set of harsh conditions. And, also, unfortunately, character development suffers a little. I wouldn't call the characters two-dimensional, but there is still the sense that they're a lot more vivid in the author's head than comes across. There's obviously potential for in-depth, compelling characters... one struggles with something like bipolar disorder, others have lost their faith, and others with their own goals and motivations, but we don't spend enough time digging in to really make them come alive. Similarly, the romantic interactions that eventually develop lack a little depth. with characters falling for each other because they're the designated interest rather than because a connection was felt. The author has done better in other books, and again, it's not terrible, and I've seen much worse in this regard from books considered classics of the SF field... but it does make it a little harder to get into unless you're in it strictly for the cool ideas (in which case, this may well be right up your alley). This book is a top notch sci-fi read, blending new ideas with a classic feel, and has immediately catapulted Karl Schroeder into my favorite authors list. This book falls into the category of hard sci-fi, but with interesting characters, a well thought out story, and some philosophy thrown in for good measure. The scientific concepts that are integrated into the setting offer a look at some of the more recent ideas about what exists between solar systems, from Kuiper Belt objects to Brown Dwarfs and their possible planetary systems, referred to in the book as the Halo worlds. The setting implies the frequency of these objects is higher than what we know of today, making these dark worlds reachable with a pre-Faster-Than-Light technology. Humans have discovered FTL drives as well, but they seem to require the deep gravity wells of normal stars to work. The aliens of this universe are few and far between as well, and none of them are anything like humans, so much so that humanity still feels very alone in the universe. I love authors who pull off unique aliens as that is what I expect such an alternative evolutionary track would do, and it helps to make it feel like it could be real. The book includes some philosophical & religious exploration as well, centered mostly on what it takes to build a sustainable galactic type civilization that could encompass many different intelligent species. The religion of many people in the current universe is called Permanence. This religion is based on the methodology and technology required for maintaining the current human civilization and also on expanding it. The religion still maintains it's following among the Halo worlds, but is repressed on the worlds around stars, where FTL can be used. From a philosophical side, the book explores the implications of FTL vs. non-FTL travel between worlds, and it's affects on the sustainability of a civilization spread across the stars. There's plenty of politics here as well, with the repressive like Right Economy which nano tags everything with a value and ownership, allowing the enforcement of payment on all uses of information and items owned by others. Ultimately this appears as a libertarian dystopia, exposing the flaws in extreme economic libertarianism. There's also some repression of freedom of religion as well, but there is not much else discussed to expose what other types of rights might also be repressed. As my initial introduction to Karl Schroeder, I found the book highly enjoyable and look forward to reading many more novels by him. In fact, I think he has managed to claim a spot in my short list of all-time favorite authors. I don't think I've encountered a book this ambitious (or this well executed) since the Hyperion Cantos. This book has kind of shaken me in a way few ever have. The primary protagonist of the story, Rue Cassels, is an amazing young girl who is force to quickly grow into strong young woman after being thrown a few fairly crazy life twists. When the book starts, her brother is attempting to sell her into slavery, only to have that turned on its head when she discovers of an abandoned starship and is I don't think I've encountered a book this ambitious (or this well executed) since the Hyperion Cantos. This book has kind of shaken me in a way few ever have. The primary protagonist of the story, Rue Cassels, is an amazing young girl who is force to quickly grow into strong young woman after being thrown a few fairly crazy life twists. When the book starts, her brother is attempting to sell her into slavery, only to have that turned on its head when she discovers of an abandoned starship and is thrown into a world she barely understands. She has a good heart though, and it slowly draws a crew around her and the ship that in some cases don't even know they've joined until the critical moment. The rest of the characters are likable, and all have their little twists! From the NeoShintoist rebel with his life-changing kami, to the professor and his studies of other alien species, everyone is just trying to survive and do the best they can while not being overwhelmed by fate and a civil war that threatens everything they hold dear. And that's to say nothing of Rue and the other halo-worlders whose life-affirming Cycler Compact is under threat from simple apathy and abandonment. Everyone has something to lose, and it takes them coming together and risking it all to make something truly special. Now, the Cycler Compact and the Rights Economy. Those two are an interesting take on interstellar civilizations, and there's a lot of politics and economics blended into their mixes. While the R.E. is a bit like capitalism gone mad (and unsurprisingly so, given the economics of travel posited in the book), the Cycler Compact is at once somber and life-affirming. I could be mistaken, but Karl may be putting his own little seed out there, and seeing how it might grow. ;) For years, I've actually worried a bit about the viability of ever creating an interstellar civilization without faster than light travel, but I'm not so sure that's a loss anymore. I think the Compact could be a better way. A hopeful way. Together. Permanence is a good ol' star-spanning sci-fi epic, dealing in interplanetary politics, with civilizations hanging in the balance. I enjoyed spending time with the main characters, each likable in their own way, though some of the side characters were underdeveloped, leaving me occasionally confused about who people were. Also confusing was a lot of the technology and terminology, which is not explained before being used. What is an "inscape window", "high space", etc? Eventually these are expla Permanence is a good ol' star-spanning sci-fi epic, dealing in interplanetary politics, with civilizations hanging in the balance. I enjoyed spending time with the main characters, each likable in their own way, though some of the side characters were underdeveloped, leaving me occasionally confused about who people were. Also confusing was a lot of the technology and terminology, which is not explained before being used. What is an "inscape window", "high space", etc? Eventually these are explained, but it takes a good quarter of the book to do so, and for you to understand what the characters were talking about earlier. The author also doesn't spend much time describing locations, or even people, leaving a little too much to the imagination. With many locals being rather fantastical in nature, a little more detail would have been nice. However the book does deal with some very good sci-fi concepts. Humanity has split into two civilizations: the Cycler Compact, with planets around brown dwarf stars, dependent on sub-light "cycler" ships to carry materials and people between stars; and the more recent Rights Economy, living around earth-type stars, with faster-than-light ships which require a large gravitational field to activate their drives, leaving the Cycler Compact out of luck, with their small brown dwarfs. As the characters get drawn into the net of intrigue going on between the CC and RE, and adding in a bit of alien technology, it makes for some extremely entertaining reading, with very few dull moments. There was a lot to like here - a great setup for a Big Dumb Object story with political and personal intrigue against a backdrop of interstellar war - but too much that failed to rise above the mediocre. I much enjoyed the worldbuilding, the civilizations came across as this-century modernizations of classic Golden Age SF Human Empires, and really worked. The technological constraints of High Sapce versus the halo worlds with regards to travel also permitted engaging space race scenarios to deve There was a lot to like here - a great setup for a Big Dumb Object story with political and personal intrigue against a backdrop of interstellar war - but too much that failed to rise above the mediocre. I much enjoyed the worldbuilding, the civilizations came across as this-century modernizations of classic Golden Age SF Human Empires, and really worked. The technological constraints of High Sapce versus the halo worlds with regards to travel also permitted engaging space race scenarios to develop naturally. The halo worlds in general were a clever conceit to shorten the unimaginable light speed gaps between human habitable star systems. The R.E. needed to be contrasted more with the halo worlds, weren't they just a more effective brand of the same 20th century capitalism that exists today? The idea that they were philosophically incompatible didn't fly at all. The speculations about the possibilities of civilizational permanace which are scattered throughout are cool, and the regrettably short section detailing the exploration of the Jentry's Envy is top notch. However, the blocking for the big action climax was so poor I could hardly keep straight who was where, and who they were shooting. Rue's conversion from lucky ingenue to omni-competent starship captain was unbelievable. Micheal was an interesting character, but his last minute conversion didn't hit with any real emotional force. Overall, I liked this book much more than the author's first book, and thought it was an improvement on every level. I'm cautiously optimistic to read Schoeder's more recent work. There are a lot of instances in this book where events would abruptly happen that the author did poorly to prepare the reader for, or significant events that are mentioned only briefly that should have gotten more description. Not being able to properly view the novel from the point of view of a first time reader is the hallmark of a first novel, in this case it's Schroeder's second- and I think it's the fault of the editor as much as the writer. The biggest example here is to have a magic scienc There are a lot of instances in this book where events would abruptly happen that the author did poorly to prepare the reader for, or significant events that are mentioned only briefly that should have gotten more description. Not being able to properly view the novel from the point of view of a first time reader is the hallmark of a first novel, in this case it's Schroeder's second- and I think it's the fault of the editor as much as the writer. The biggest example here is to have a magic science fiction technology X that late in the novel turns to be used in a brand new way that supposedly no one else had thought of. Because the author only poorly defined the limitations in the first place it's not really a revelation at all, just an arbitrary change of rules for convenience. And after that none of the characters takes a moment to realize that this new application renders their past motivations and current plans mostly pointless. Iain M. Banks 'The Algebraist' in contrast does this much better. There's aspects of this book that if someone told me it as a concept, I would probably react negatively to it and never read it. Mistake. Big mistake. Schroeder takes this plot and characters and weaves a really good tale out of it. It's not "high fiction", but it doesn't pretend to be. It is a solid, well-planned and executed story about a technology and civilization that exists for these characters to populate, suffer and succeed in. This book makes the author someone who I want to keep in mind There's aspects of this book that if someone told me it as a concept, I would probably react negatively to it and never read it. Mistake. Big mistake. Schroeder takes this plot and characters and weaves a really good tale out of it. It's not "high fiction", but it doesn't pretend to be. It is a solid, well-planned and executed story about a technology and civilization that exists for these characters to populate, suffer and succeed in. I simply loved this book. I only gave it four stars instead of five because I can see some of the seams, so to speak - the plot jumps around a bit at points and the character development is a bit unrealistic. But aside from that, from page one this book just sucked me in. So many "sense of wonder" moments, a fascinating backstory and a set of conflicts, and very human characters trying to make sense of it all. Perhaps one of out five scifi books I read has this combination. When it finished, I d I simply loved this book. I only gave it four stars instead of five because I can see some of the seams, so to speak - the plot jumps around a bit at points and the character development is a bit unrealistic. I thought Permanence had a shaky start, mostly because the dialogue and some of the descriptive passages fell a bit flat. Really liked a couple of the Big Ideas and the narrative arc, though - Rue, the protagonist, is strong without being entirely one-dimensional or ridiculous, which is rare among the SF penned by men that I've read. Recommended for SF enthusiasts and people who like thinking about what it would take to build human civilizations beyond Earth with (mostly) conceivable technology. I read this for my SciFi book club. There are a lot of great ideas in this book, enough for several books. Unfortuneately, almost none of them are well explored, some only getting a brief mention before moving on. The character development is almost non-existant. The plot is ok, but uneven and jumpy - you can't tell how much time has elapsed between scenes, etc. Started this as a library book and ran out of time to read it... love Schroeders space civilization concepts. This didn't grab me as much as the Virga series has but its on my to-do list to finish all the same. 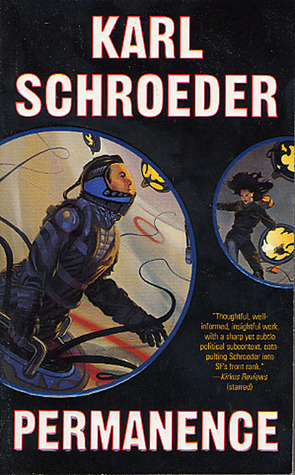 Karl Schroeder is an award-winning Canadian science fiction author. His novels present far-future speculations on topics such as nanotechnology, terraforming, augmented reality and interstellar travel, and have a deeply philosophical streak. One of his concepts, known as thalience, has gained some currency in the artificial intelligence and computer networking communities.